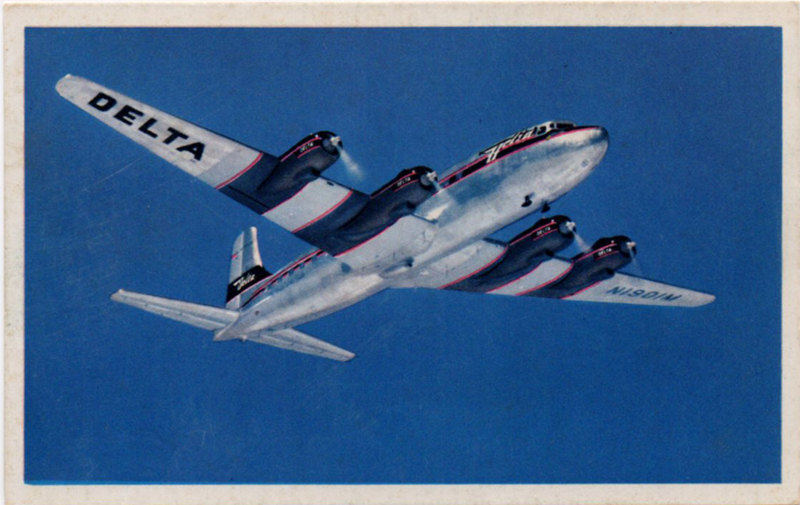 Both of these postcards show a Delta DC-7 with different livery (color scheme). And, except for the livery, they both feature the same photograph. Whoever did the retouching was really good. These are from the mid- to late-50s. This particular DC-7 was “written off” in 1962, after a service of eight years. 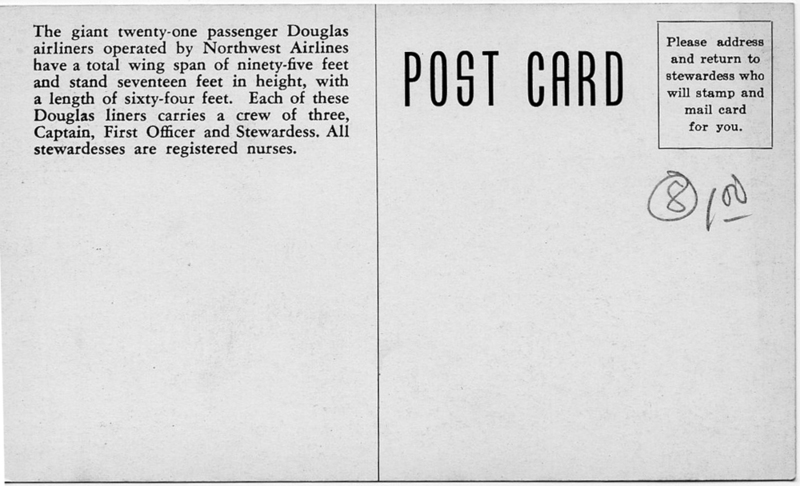 The card was printed by Delta and included in folders presented to passengers upon boarding. 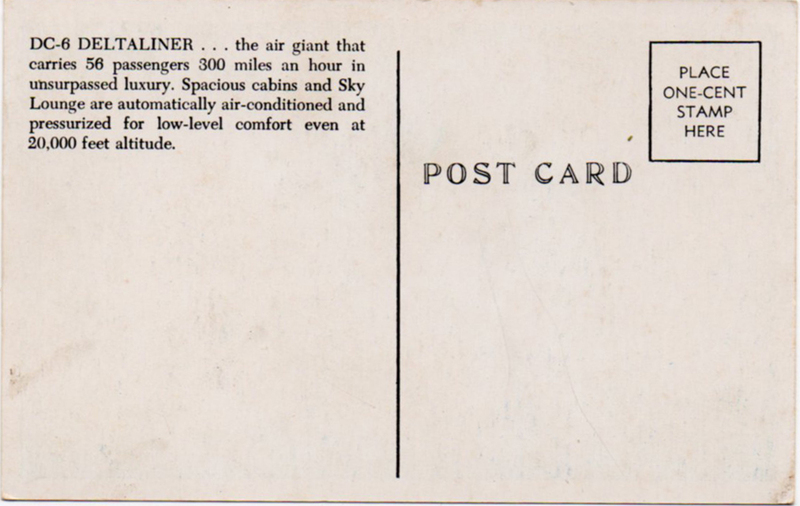 The flight attendant would mail this card for you at no charge (I think). All you had to do was address the card and scrawl something banal as a message. Posted in Existing photo processed by Bob Lawrence, Uncle Bob's Pix and tagged DC-7 Golden Crown, DC-7 N4871C, Delta Airlines. Bookmark the permalink. This is a photo montage. I’ve seen the same aircraft with different backgrounds. 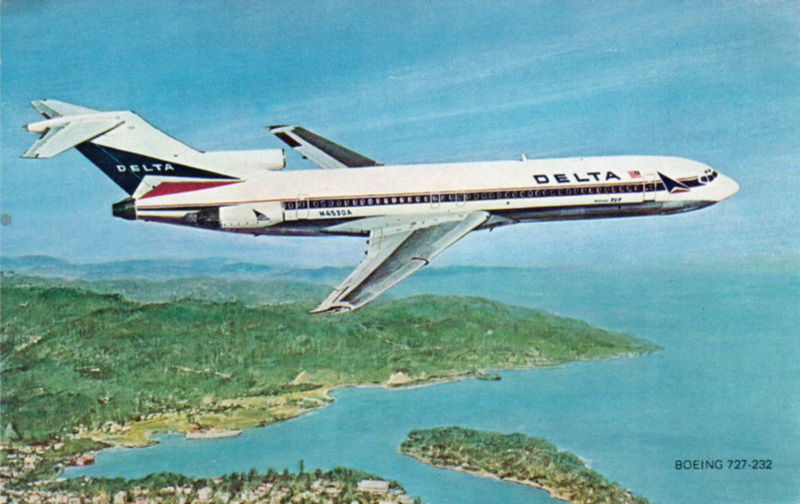 The craft is a Boeing 727-232 delivered to Delta in 1973. Delta flew it for 11 years, the it went to People Express, then Continental and finally to Kitty Hawk Aircargo before it was scrapped in 1999. It’s N453DA. The card is probably one published by Delta and included in the “Welcome Aboard” folder passengers were given. The card may date to the early 70s. I didn’t pay $2.50 for it. Everything at the antique store was half off that day. 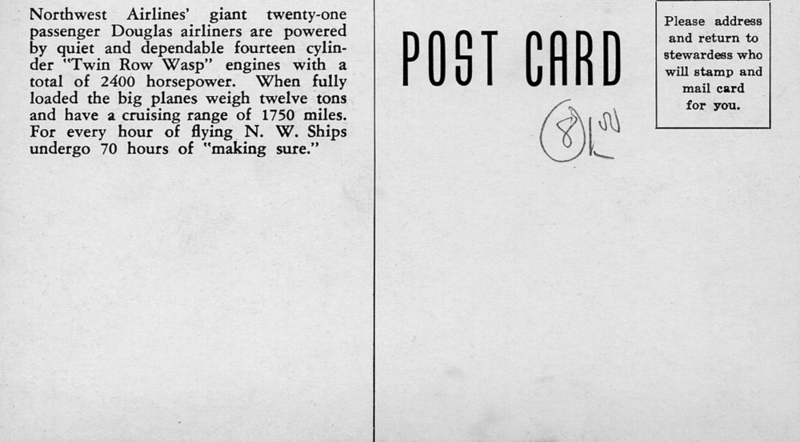 Surprisingly, this one was actually in the “Aircraft” section of several boxes of cards. Posted in Existing photo processed by Bob Lawrence and tagged Continental Airlines, Delta Airlines, Kitty Hawk Aircargo, N453DA, People Express. Bookmark the permalink. No publisher is noted, but it has to be a puff piece for Delta, comfortably dated to between 1949 and 1951. 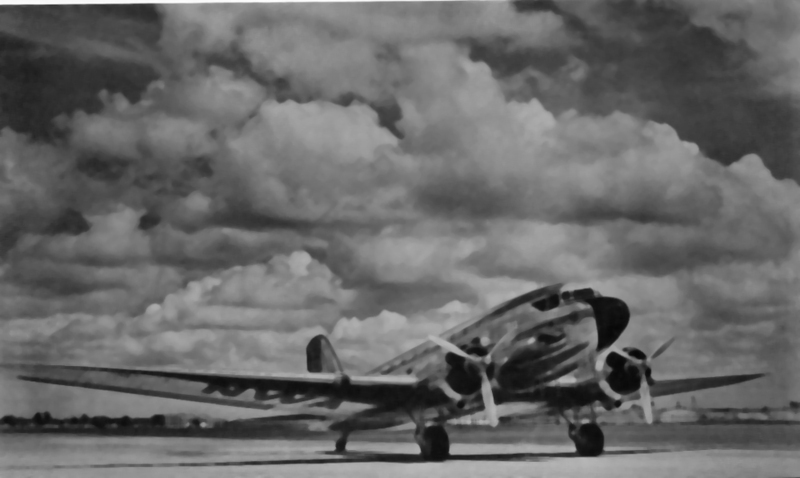 Delta took delivery of their first DC-6 in 1948. They were retired in the early sixties as jets took over. Why 1951? 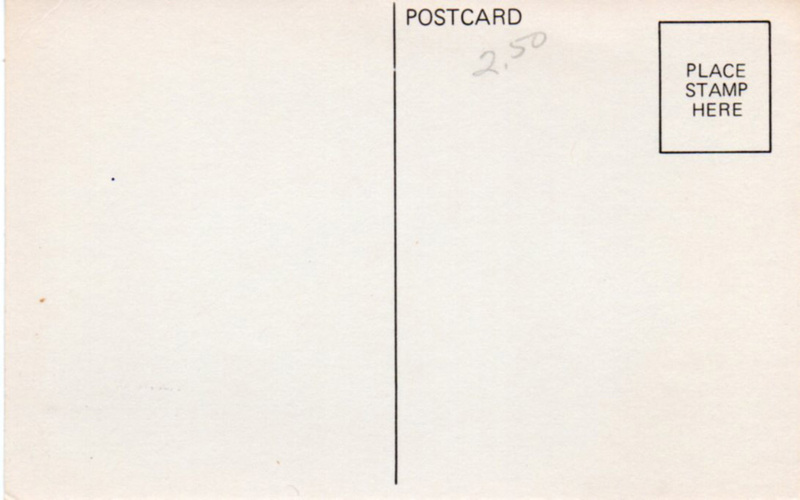 Because, as pointed out on other posts on the web, postage rates for postcards went up to 2 cents in ’51. This was printed prior to that. 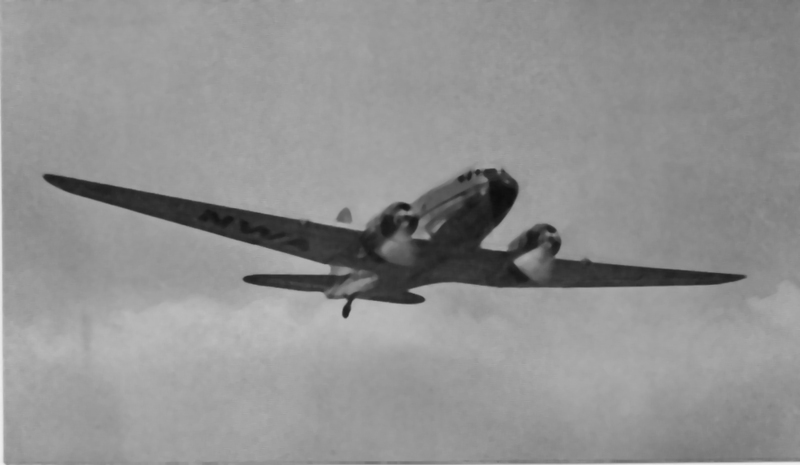 Posted in Existing photo processed by Bob Lawrence and tagged DC-6 Deltaliner, Delta Airlines. Bookmark the permalink.